In the aroma we smelled a perfumed and floral essence, which turned to fresh cut grass and tea with the addition of water. The body was light and delicately tea-like. The acidity was punchy, with apricot, nectarine, and tropical fruit coming through in waves. The sweetness was unrefined sugar cane, southern sweet tea, and corn-syrup, which impressed with the sheer intensity of it. Complexity was highlighted with floral rose and jasmine, as well as a tannic presence that took the cup back to the tea-like characters. Ultimately it was clean and quick in the finish, but rather satisfying on each sip. Square One Coffee is an award-winning micro-roaster based in Lancaster, Pennsylvania, with retail locations in Lancaster and Philadelphia. As a small, family-owned business, they take pride in their small batch, handcrafted approach to roasting and serving the highest quality specialty coffee. Their highly skilled staff boasts several Specialty Coffee Association of America (SCAA) Certified Lead Instructors, several Barista Guild of America (BGA) Certified Baristas, and a Licensed Q-Grader. Square One believes that people matter, so they do their best to respect every person involved in the process of getting coffee from the seed to your cup—from the farmers, to their roasters, to their baristas, to their customers. Categories: Coffee Ratings. Origins: Ethiopia. Flavors: Apricot, Cane Sugar, Corn Syrup, Jasmine, Nectarine, Perfumed, Rose, Sweet tea, and Tea-like. Brew Descriptors: Floral, Fruity, and Juicy. 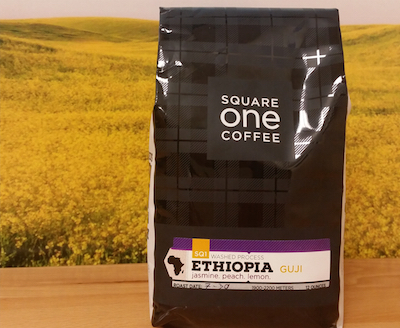 Roasters: Square One Coffee.